4 years ago I had one of my first significant breakthrough moments when I was THE featured story on the St. Louis evening news for my work with Fight the Fight. Every day so many major events (good & bad) are happening in the city it’s almost impossible to for the news networks to keep up. In other words, they are never short on content to broadcast. I was able to convince one of the biggest networks in the greater St. Louis Metro Area to send a full crew an hour and fifteen minutes from the city to my little hometown of Gillespie, IL to interview me for their top story. The whole experience was amazing and scary at the same time. The scary part was when I got the call from a producer confirming their crew was actually on the way. My company, Fight the Fight, had no storefront, company headquarters, or physical space of any kind other than my parent’s basement! But I managed to purposefully and gracefully omit that information on the phone that morning. So I scrambled to borrow a few mannequins at the last minute to display some of the shirts I sold behind me (shown above) while sitting on a stool in the center of the basketball court at the local gym. When the camera crew and journalist arrived they were confused. They thought they were supposed to be shooting the piece in a clothing store. 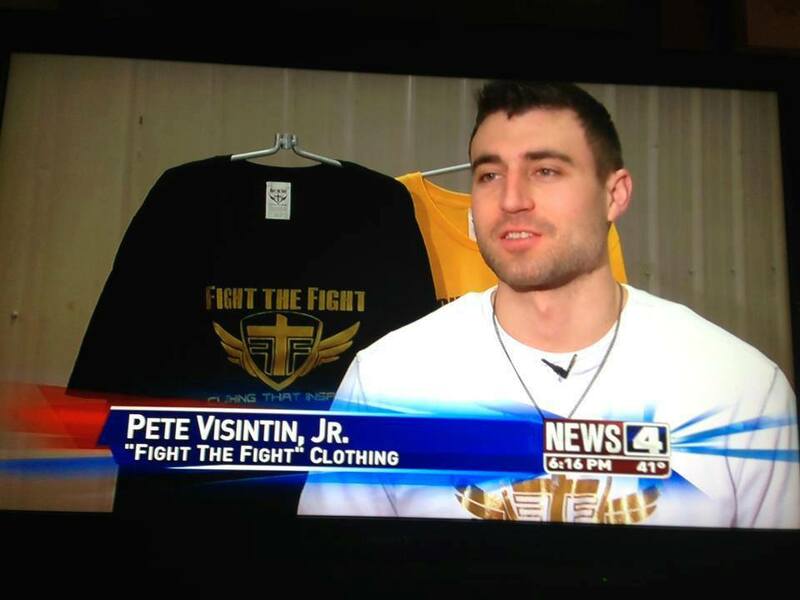 20 minutes later we wrapped filming, they sent the footage to headquarters for editing, and at 6:00pm CST…BINGO!…There I am on the stool with my Fight the Fight shirt on and social media URLs plastered across every TV screen in the St. Louis Metro Area! Hundreds of people outside our local rural area instantly became fans of our facebook page and joined our email list. They wrote nice comments, they sent encouraging messages, they shared the page with their friends, AND they purchased shirts, lots of them!…BREAKTHROUGH! While it’s an entertaining story, what I didn’t tell you about was the 2 years of grinding late nights, early mornings, lugging our small inventory of products and business cards to vendor shows and craft fairs every weekend sometimes in the pouring rain or blazing heat, the roller coaster ride of highs and lows, and the constant work to grow the audience for the brand one person at a time, day by day by day. But slowly, like the mountain below the surface of an iceberg, we built a foundation of support from our local communities and people who could relate to our cause across the Nation through the use of social media. Before the I ever got the call from that producer at the news station, people who supported our efforts with Fight the Fight bombarded the network’s facebook page with hundreds and hundreds of messages. They were like the stubborn salesman who just refused to stop calling on a prospect until they get a "yes!" Eventually, after enough time and effort we got the right person’s attention which set the story capturing process in motion. If we do the right things frequently and consistently over a long enough period of time, breakthrough moments will naturally happen for us all. The trick to getting more breakthrough moments for yourself or your business is to never look at them as goals but as blimps on the radar or spikes in the price of a stock that is already gradually trending upwards. Keep working. Keep taking calculated risks. Keep building. Don’t chase breakthrough moments or tipping points. Commit to the execution of your strategy, and let them come to you! Subscribe to our email list to get all of our articles delivered straight to your inbox once a week!